Kathleen Pingelski, president of MicroKnowledge and ProKnowledge, is the same age her father was when he had his first heart attack. Cindy Applebaum, market president and publisher of The Albany Business Review, lost her best friend at the age of 39 to a heart attack. These are the two main reasons that both women are chairing the 2019 Go Red for Women campaign, which culminates in the 15th annual Go Red for Women Luncheon on Thursday, May 16, at the Albany Capital Center, 55 Eagle St., Albany, on May 16, from 10 a.m. to 1:30 p.m. The day features health screenings, an exclusive breakout session with past leaders of Go Red, the introduction of the 2019 BetterU class, the famous “Purse-Onality” auction, presentation of the Crystal Heart Award, a heart-healthy lunch and a moving survivor story. Pingelski has been involved with the American Heart Association since she was a participant in the first BetterU class in 2011. She has been a member of the Circle of Red (a giving society), and part of the Capital Region Heart Walk and Run. She has served as a volunteer spokeswoman on a regular basis. Applebaum thought of her friend Patty Hart when Pingelski asked her to co-chair the Go Red for Women movement. Applebaum, who grew up in North Albany, is glad to be giving back to her hometown community. “This community has been very good to me, and I want to give back while also getting out a message that is so important,” Applebaum said. Applebaum was diagnosed with multiple myeloma five years ago. Applebaum is an avid tennis player, and works out daily with a personal trainer. She also incorporates small bursts of activity into her day – parking far from her destination, getting up every hour to stretch, walking around the Business Review office. Pingelski, 50, grew up in Ulster County, received an associate’s degree from Ulster County Community College and a bachelor’s degree from SUNY Oneonta in elementary education. But an entrepreneurial flair led her to her current work. She joined MicroKnowledge in 1994 and has owned 50% of it since 2005. She started ProKnowledge in 2015. Pingelski was a Woman of Excellence, A Woman Who Means Business, one of the Times Union’s 10 Women to Watch, and MicroKnowledge has been named one of the area’s Best Places to Work. She is active with WERC (Women’s Employment and Resource Center), has been on the executive committee of the Tour De Cure, and is still active with Circles of Mercy, where she has served on the board. She and her husband Robert live in Clifton Park, and have three children, Emily, 19; Brendan, 18; and Sean, 15. Applebaum, 64, is a graduate of St. Joseph’s Academy. Applebaum was the area manager for Nextel for Albany, Syracuse and Vermont before becoming the general manager for the media group at Time Warner Cable, where she worked for 11 years. She has been the market president and publisher at The Albany Business Review for two and a half years. Applebaum serves on the board of the Center for Economic Growth and the New York Press Association. A widow, she has two children, Zak, 26, and Jordyn, 25. Since taking on the role of co-chair of Go Red for Women, Applebaum has worn something red every day – even if it’s just her manicure – as a reminder of the importance of the mission. In today’s State of the State, Gov. Andrew Cuomo signaled an important step in the campaign to protect New York’s youth from the dangers of smoking and e-cigarette use. By raising the minimum legal sales age for tobacco products, including e-cigarettes, New York State can change the narrative pushed on youth by Big Tobacco. The American Heart Association also hopes that that the 2019 Legislative Session brings initiatives to improve access to healthy foods and nutrition, and physical activity in schools. “We are glad to see that Gov. Cuomo plans to prioritize education for this coming year. The academic performance and physical wellness of children go hand in hand, so focusing on strengthening school wellness policies in New York makes sense,” O’Brien said. Heart disease and stroke are the No. 1 and No. 5 killers of all Americans. The American Heart Association’s mission is to be a relentless force for a world of longer, healthier lives. 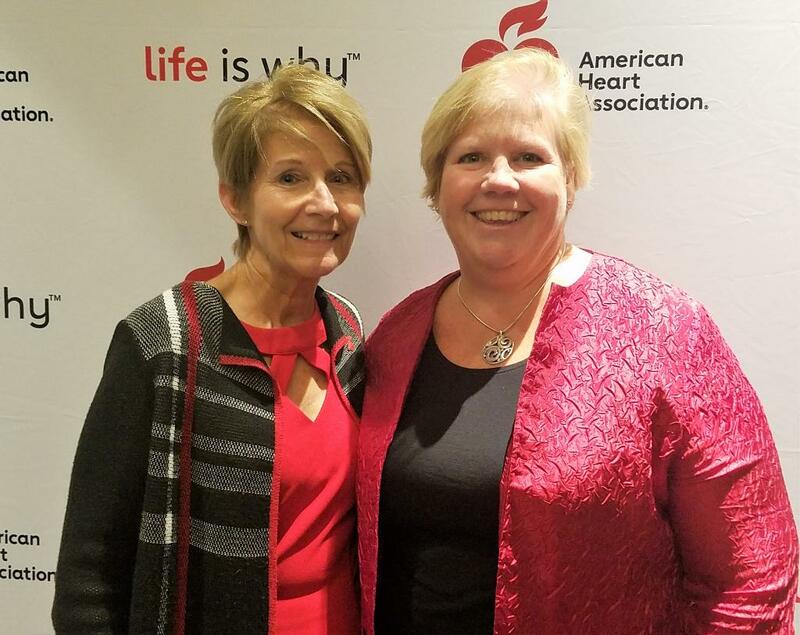 Jenniffer Snyder Wright remembers watching the 2016 BetterU class at that year’s Go Red for Women Luncheon, and telling her employer, Andrea Crisafulli, who had invited her to the Luncheon, that she needed to be part of the American Heart Association’s 12-week heart-health improvement program for women. On Thursday, January 3, at CAP COM FEDERAL Credit Union in Albany, Wright shared her story of being in the 2017 BetterU class. As she participated in the program, her headaches went away, and swelling in her body decreased. She also gave up what she described as a “nasty daily Frappuccino habit” as part of her wellness journey. She has also become the coordinator for the newly formed BetterU alumnae group. Wright is sharing her story as the application period for the 2019 BetterU class opens. Last year, 137 women applied. 13 were chosen. This year’s deadline to apply is January 24. 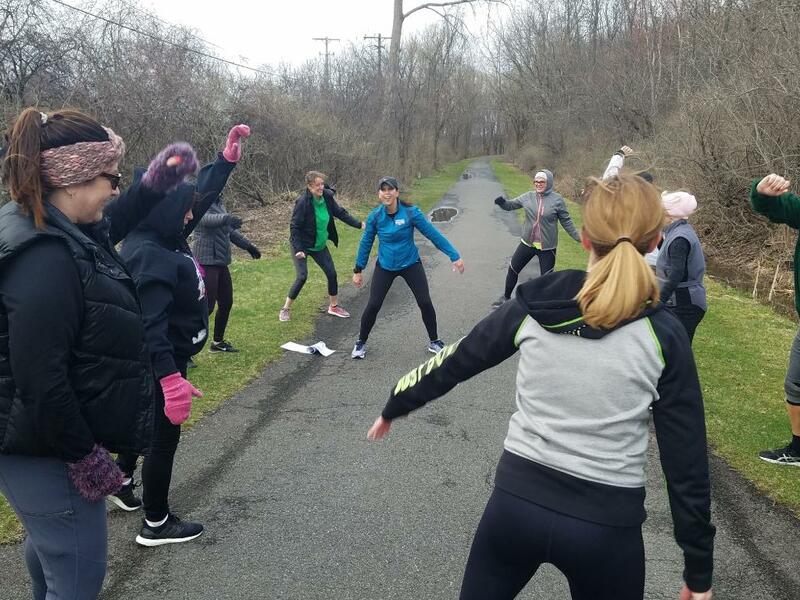 Today, Amelia Waters of the Capital District YMCA staff led exercises – demonstrated by a 2018 BetterU grad – and BetterU co-chair Maria Decker of Maria’s Catering provided healthy snacks. Ellie Wilson, senior dietitian for Price Chopper/Market 32, offered nutrition advice, and Dr. Mandeep Sidhu, cardiologist at Albany Med and immediate past president of the Capital Region Advisory Board of the American Heart Association, talked about how important it is for women to take care of their health. When the 12-week program begins in late February, BetterU participants receive memberships to the Capital District YMCA, learn about nutrition and food shopping from Wilson, a senior dietitian at Price Chopper, work with a personal trainer and meet weekly for group workouts and support. They celebrate their success with hundreds of attendees at the Go Red for Women Luncheon. “For nine years, we’ve watched a group of BetterU women improve their heart health. It is always inspiring and motivating, and I can’t wait to meet this year’s class,” said Maria Decker of Maria’s Catering, member of the Capital Region Advisory Board and co-chair of the BetterU subcommittee of the Go Red For Women Luncheon. Assemblywoman Patricia Fahy also spoke. Applications for the BetterU are available at CapitalRegionNYGoRedLuncheon.heart.org, and at locations of the Capital District YMCA. Theresa Petrone Butts, Leader of IT Vendor and Budget Management at MVP Health Care, and Adanna Akujuo, M.D., cardiothoracic surgeon and associate professor of cardiothoracic surgery at Albany Med, are leading the Capital Region Advisory Board for the next two years. Today, Sept. 4, the Essex County Board of Supervisors took an important step in protecting the youth of the county by raising the minimum legal sales age for tobacco products to 21. This is the first county in the North Country to pass the measure. The American Heart Association and the American Cancer Society applauded the board’s action. Bob Elling, paramedic, resident of Essex County and member of the American Heart Association’s New York State Advocacy Committee, attended the meeting, and has been a staunch advocate of Tobacco 21. With Essex County’s passage of Tobacco 21, there are now 23 local jurisdictions in the state that have passed the measure. On Tuesday, Sept. 4, at 10 a.m., the Essex County Board of Supervisors will vote on Tobacco 21, a measure that would raise the minimum legal sales age for tobacco products to 21. If you live in Essex County, would you contact your legislator and ask them to pass this measure? We’ve provided a letter you can adapt, as well as a link that will give you contact info to YOUR supervisor. Tobacco 21 will protect our youth from the ravages of smoking! As a resident of Essex County, and your constituent, I am very pleased to see that the Board of Supervisors is considering Tobacco 21. This common-sense legislation will protect the health of our young adults by raising the legal sales age of tobacco products to 21. With all the misinformation out there about electronic cigarettes and, specifically, JUUL’s, it’s important to remember that science is on our side. An Institute of Medicine report shows that by increasing the sales age of tobacco products to 21, there will be a 12% reduction in the smoking rate. This means future generations have the potential to be smoke free. With tobacco use remaining the leading preventable cause of heart disease and stroke, the nation’s number one and number five causes of mortality, any measure that can help tobacco addiction is critical. By passing this law once and for all, we are keeping youth from ever picking up their first tobacco product and we are eliminating the main source of tobacco products for this age group, their friends. After all, a sixteen-year-old is far more likely to know an eighteen-year-old than a twenty-one-year-old. And, if a person makes it to 21 without ever smoking, the chances of them ever doing so drops to only 2%. This is extremely important given that 95% of smokers report starting before they turned 21. With 19 municipalities in New York, Albany, Onondaga and Cortland Counties, having passed Tobacco 21, I am eager to see the same health protection extended to our residents. With over $10 Billion dollars spent annually on health expenditures from tobacco related diseases, this legislation saves lives and money. Please support Tobacco 21 at the upcoming vote on Tuesday, September 4th. The American Heart Association, the American Cancer Society and the American Lung Association are urging the Essex County Board of Supervisors to be the next county in New York to pass Tobacco 21, which would raise the minimum legal sales age to 21, thus protecting the North Country’s youth from the extreme dangers of smoking. The Board of Supervisors will vote on Tobacco 21 during their 10 a.m. meeting on Tuesday, Sept. 4. Twenty-three localities have already passed Tobacco 21. This is the second time that the Essex County Board of Supervisors has considered the measure. Adrienne Weitzel, RN, MSN, Stroke Coordinator at Albany Med, shares her reason for being part of #CycleNation in the Capital Region. Caring for stroke patients truly takes a team approach to ensure our patients in our communities receive the optimal stroke care from recognition of stroke like symptoms to discharge. As the Stroke Coordinator at Albany Medical Center, I have the pleasure of helping stroke patients and their families through this difficult process through collaboration with our community, regional transferring facilities, and within my own organization. Stroke care starts with educating our community about the signs and symptoms of a stroke, what to do if someone is experiencing stroke like symptoms, and the risk factors associated with a stroke. For me, collaborating with the American Heart/American Stroke Association and CycleNation is a way to give back to my community. This event will bring Stroke to the forefront of our region, and has the potential to educate many of our community members about stroke. Making those in our community more aware of stroke can change so many lives!!!! Let Essex County legislators know you want Tobacco 21! Our Government Relations Director Caitlin O’Brien has an update from Essex County, where the board of supervisors will vote again on Tobacco 21 on Sept. 4. Will you help? The list of legislators to contact is at the bottom of Caitlin’s update. The American Heart Association is thrilled to see Tobacco 21 getting a second chance in Essex County. Tobacco 21 would raise the minimum legal sales age for tobacco products to 21. Tobacco and e-cigarette use remains a deadly addiction, one that is not going away on its own. 73,000 New York high schoolers currently smoke, and 10,600 high school students become daily smokers each year. This sets them up for a lifetime of chronic, often fatal diseases. Across the state, Tobacco 21 is very popular. We know that 23 localities across the State have enacted their own Tobacco 21 laws – a major accomplishment. This means roughly 75% of New Yorkers live in an area where youth are protected from the tactics of the tobacco industry. We also know why Tobacco 21 is so popular, and it’s because it works. Tobacco 21 will successfully prevent young adults from ever picking up their first tobacco product. We have the science to prove it. A 2015 report form the Institute of Medicine found that raising the legal sales age of tobacco products to 21 would reduce the smoking rate by 12%. The Institute of Medicine also looked into the impact raising the age to 19 would have. They found it to be minimal. By increasing the purchase age, high school students will have a harder time getting tobacco products and giving them to their younger friends. Simply put, kids in high school do not “hang out” with 21-year-olds. It’s important to point out the important role local governments play, especially given the inaction at the state level. Until we see a state-wide Tobacco 21 policy, it is the job of local governments, like the Essex County Board of Supervisors, to step in and issue the necessary public health protections. Will you join us in asking the Essex County Board of Supervisors to pass Tobacco 21? Tobacco 21 is on the agenda for Sept. 4. Simply send an email to the addresses of the Board of Supervisors, listed below, with this sentence: Please save lives by pasting Tobacco 21 in Essex County. Members of the CycleNation committe are ready to “ride the revolution.” Join them Sept. 27 at Brown’s Revolution Hall. The American Heart Association and American Stroke Association, the world’s leading voluntary health organization devoted to fighting cardiovascular disease and stroke, will host the Capital Region’s first CycleNation event at Brown’s Revolution Hall, 425 River St., Troy, on Thursday, Sept. 27, from 4:30 to 8:30 p.m. The event will feature 50 stationary bikes taking up the floor, with teams of four to eight already forming to raise $2,000 or more per bike. Upbeat music and activities designed to raise awareness about stroke will complement the evening’s cycling; 11 bikes are already booked, so the Heart Association encourages participants to form their teams and register now. Cycling will take place from 5:30 to 7:30 p.m., followed by a one-hour social gathering to celebrate the success of CycleNation. By igniting New Yorkers to pedal together, CycleNation aims to break the cycle of unhealthy behaviors and advocate for heart and brain health. “Stroke used to be the No. 3 killer in the U.S., but scientific advances improved that statistic, and now it’s No. 5. Yet, it remains the leading cause of long-term disability in our nation. CycleNation can continue to fund the American Heart Association/American Stroke Association’s research funding, so that more people can live long and healthy lives,” said Dr. Alan Boulos, chair of the Department of Neurosurgery at Albany Med and member of the Capital Region Advisory Board of the American Heart Association/American Stroke Association. Paula Symanski is a stroke survivor, and an avid cyclist. In 2016, when she was the Stroke Ambassador for the American Heart Association, she re-created her ambulance ride from Ellis Medicine to Albany Med on her own bicycle. Symanski is part of the committee that is planning the first CycleNation event in the Capital Region. Nearly 81,000 people in the U.S. die from heart disease, stroke and other cardiovascular diseases. In fact, someone in the U.S. dies from stroke about every 4 minutes and from heart disease about once every 84 seconds. Unfortunately, despite our best efforts, heart disease is still the No. 1 killer of all Americans and stroke is the No. 5 killer and the leading cause of long-term disability. Recent studies suggest that physical activity, like cycling, can help maintain strong brain function and mental sharpness. Cycling strengthens heart muscles, lowers resting pulse and reduces cholesterol. Cycling can also prevent heart disease and aid in faster recovery for stroke patients. CycleNation is a movement to empower Americans to use cycling to help improve their health while raising funds to continue vital community programs and support research to end stroke and heart disease. To learn more about the “party on a bike,” including information about recruiting a team, how to register and fundraising tips, contact Jessica Pettengill at 518-626-8759 or Jessica.Pettengill@heart.org. Information is also available at CycleNation.org/CapitalRegionNY. A video showing events in other locations can be found at: https://www.youtube.com/watch?v=DxT1qgKoNy4. CycleNation is nationally sponsored by Amgen Cardiovascular. CAP COM Federal Credit Union is a local sponsor of CycleNation. The CycleNation committee in the Capital Region includes Jack Bevilacqua, Paramedic, Albany County International Airport Fire Department; Amanda Blanchard, Coldwell Banker Prime Properties; Laurie Bryda, State University Construction Fund; Roslyn Cardish, SEFCU; Katrina Dinan; Rosella Elliott, vice president, Steps for Stroke; group leader, Brain Injury Association of New York State Women’s Support Group; Kate Fruscione, CAP COM Federal Credit Union; Bobbi Hammond; Robbie Maccue, Paramedic Captain, Town of Colonie EMS; Paula Symanski, The Community Hospice; and Katie Yarbrough, CSL Behring.